The Town North Band has given me the opportunity to play my trombone for 22 years. Prior to joining the band I kept my skills alive as I had opportunity to play an occasional solo in my church. Since I moved from city to city in my work, I participated in various church orchestras. I learned to play the trombone when I was in seventh grade in my home town of Gasport, New York. There I played in the school orchestra and band. After graduation from high school I played in two local marching band: American Legion and Harrison Radiator, a division of General Motors. Both groups played at fireman's field day gatherings each Saturday in local communities. At Syracuse University I played in the football band for a fall semester prior to four years in the army during WWII. For the past 14 years I have played in the Symphonic Winds group and the Jazz group at Richland College. I also studied all of the musical courses taught at Richland College. In addition I studied trombone with Phil Graham, 2nd trombonist in the Dallas Symphony Orchestra. Simultaneously, I played for 10 years with the Richardson Community Band. Roger Franklin Keough went to be with the Lord, Jesus Christ his Savior on Monday October 26, 2009. He passed away peacefully knowing that his home where he was going would be filled with joy! He was born in Gasport, NY, on February 7, 1921, to John Franklin "Frank" Keough and Nellie Mae Chaplin. He graduated from Gasport Union High School and then entered Syracuse University. World War II took him out of school and into the Army Air Corps where he met his wife of 42 years, Albena Kulinski. Upon leaving the military, Roger worked for the Scully Jones Corporation, later to be known as Bendix Corp., as a sales engineer in industrial tool sales. He was a Sunday School teacher for 58 years, much of which was serving at the Casa View Baptist Church in Dallas, Tx. 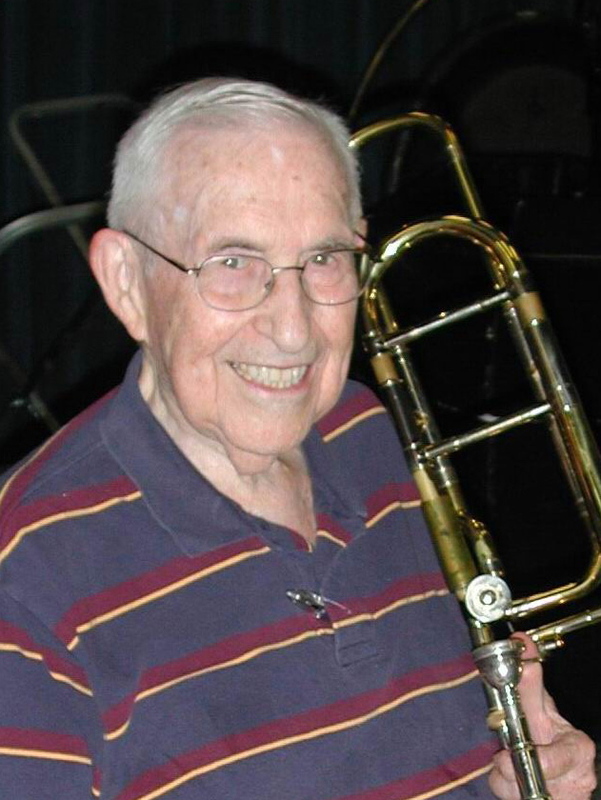 He played his trombone for the city of Dallas Brass Band Orchestra and the Town North Concert Band, read books to the blind, painted with oils and even went back to school at Richland College at age 72 until he quit taking classes at the age of 86. He was a gentle but strong husband, father and friend. Roger is predeceased by his wife, Albena and his first born son, Roger Jr. He is survived by his three children, Kathleen Schoene and her husband, Jim, Deborah Purdy and her husband, Dave, Mark Keough and his wife, Kimberly, Marcia, mother of Mark's four children, his stepmother, Beatrice Keough, his half sister, Susan Lia and husband, Dennis, along with 13 grandchildren and his beloved girlfriend, Maxine Lentz. Roger was buried with full military honors at the Veterans Memorial Cemetery in Houston, TX.